The Greens are pushing for medical cannabis crops to be grown in South Australia – sooner rather than later. Greens MLC Tammy Franks today called a press conference on the steps of the state’s Parliament House. Ms. Franks stated the party was standing with farmers who are ” ready, willing and able” to cultivate medical cannabis crops in the state’s south east (with the blessing of local councils) and supporting patients in desperate need of the benefits of cannabis-based medication. A motion was introduced to Parliament today to call on the Weatherill Government to take action on medical cannabis in South Australia from the ” farm to the pharmacy to the patient”. South Australia’s government is feeling the heat after neighbouring state Victoria recently passed legislation permitting the cultivation and manufacture of marijuana for medicinal purposes. South Australia has taken a wait-and-see approach with regard to the crop; a position it may not be able to take for much longer as the vast majority of South Australians support the use of cannabis for medical purposes. The state government has been accused of being well behind best-practises by SA Opposition Leader Steven Marshall. The situation in South Australia is quite curious given the state has soft laws on possession of small quantities usually associated with recreational use. 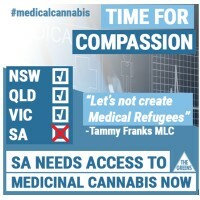 Ms. Franks believes the situation in South Australia could lead to more “medical refugees”; people forced to move to other states to access treatment. An example used at today’s gathering was that of the Fulton family. Sisters Georgia-Grace and Tabetha Fulton suffer from a rare degenerative lung disease. The family moved to Canada last year, where the girls had legal access to cannabis-based medicines and their condition significantly improved. “For Tabetha and Georgia-Grace to access it safely in our own state would be absolutely life-changing,” said the girls’ mother.